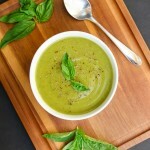 If you’re looking for comfort in a bowl, try this Creamy Vegan Potato Leek Soup recipe! It’s one-pot, made with basic ingredients, rich and satisfying, and the perfect family friendly meal to warm you up! One big bowl of comfort food. Creamy and rich, hearty and filling, and a family favorite is exactly what this Creamy Vegan Potato Leek Soup is all about! I’m all about soups. They’re the perfect one-pot meal to throw in just about anything. Sweet, savory, or spicy flavors. 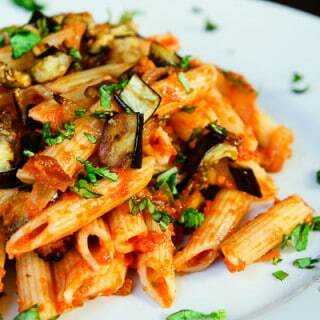 Different textures such as pureed, creamy, chunky, or whole pieces of cooked veggies , noodles, and/or beans. 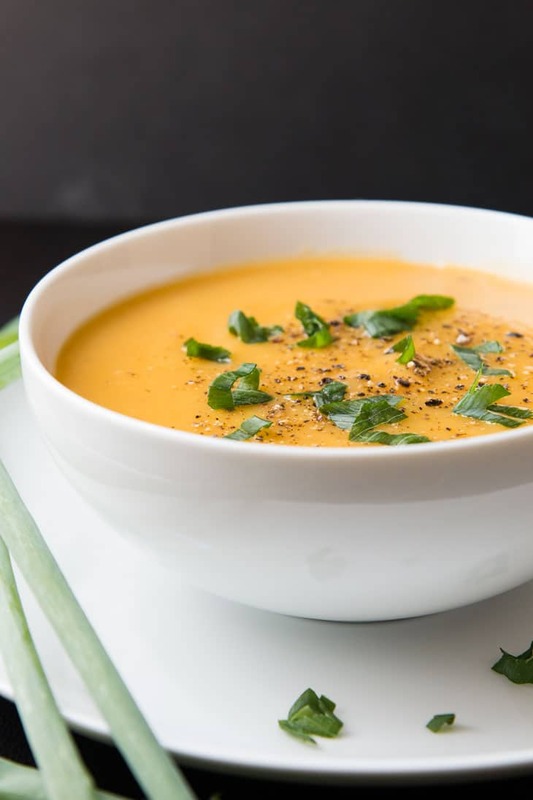 Soups can be enjoyed cold or hot, and every cuisine has it’s own unique soups and flavors. So you see…when it comes to soups, the possibilities are endless and you never get bored. 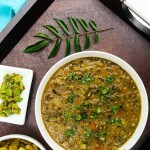 Plus, that aroma that comes from simmering all the herbs and spices together with the broth is just to-die-for. All About Leeks. I love the flavor and use of leeks in cooking. They’re in the same family of vegetables as garlic and onions and contain many of the same beneficial components. I feel like most people don’t think of cooking with leeks, assuming they’re basically overgrown green onions, when in fact they have their own distinct flavor. Leeks are generally tougher and milder because of their larger stalk. Their white and light green parts are generally the most edible and used in recipes. They add a nice subtle flavor without overpowering dishes. My five favorite ways to enjoy leeks. 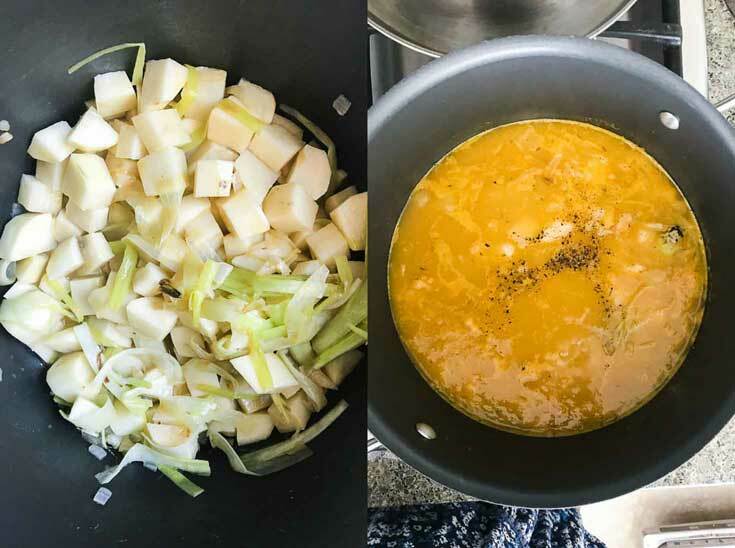 Leeks are typically available throughout the year (especially here in SD), but they are in season and best from Fall to early Spring, which is when I go crazy making this vegan potato leek soup recipe. It’s hard to resist, especially when you see the large gigantic leeks at the stores. 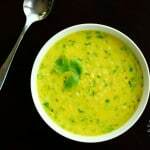 I love this vegan potato leek soup recipe because it’s simple, yet flavorful with the addition of garlic and herbs. There are no other fancy ingredients. I also love that it’s so rich, thick, and creamy because of the potatoes. 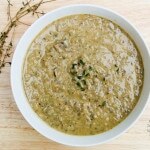 This soup has definitely become a family favorite! This soup is served best with either a grilled cheese sandwich or some homemade garlic bread. Our current favorite pairing is with my Jalapeno Popper Grilled Cheese Sandwich. If you’re looking for comfort in a bowl, try this Creamy Vegan Potato Leek Soup recipe! And don’t forget…leftovers taste even better the following day! 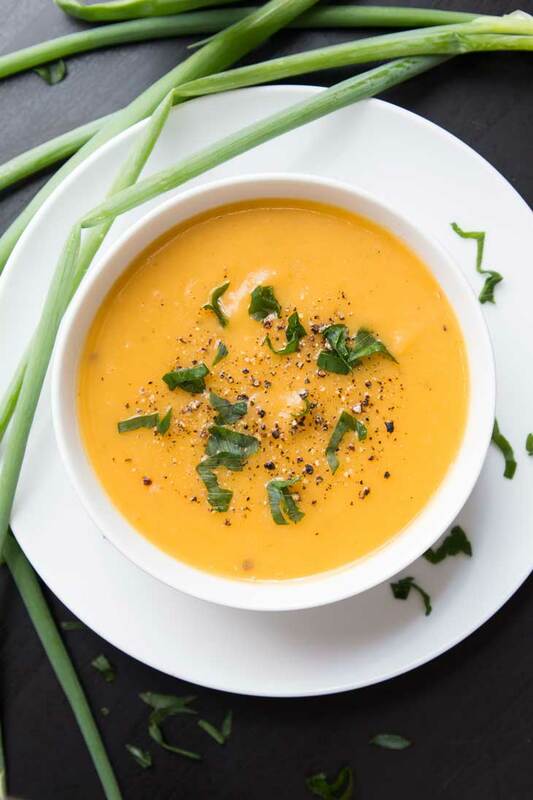 This potato leek soup is creamy, vegan, and the perfect family bowl of comfort! Cut off the dark green part of the top and bottom roots (the white and light green parts should be left). Cut the leeks in half lengthwise. Slice them lengthwise into about 1/2" strips. Wash them really well after slicing (leeks tend to be filled with dirt between the layers and near the root). In a large pot, melt the butter (or add cooking oil) over medium heat. Add leeks, garlic, shallots and cook until tender. Add leeks, garlic, shallots and cook just until tender. Add all the potatoes, 1 cup vegetable broth, and a few pinches of salt. Combine. Cover and cook until the potatoes soften. Make sure you add enough broth so that the potatoes don't burn. Add the remainder of the vegetable broth, bay leaf, dried thyme, lemon juice, salt, and pepper. Cover and bring to a boil. Reduce heat and simmer until the vegetables are very tender (about 30 min.). Use a hand blender to puree everything in the pot. Thin the soup with additional stock if it is too thick. Season with salt, freshly ground black pepper, and additional lemon juice (if needed) to taste. Garnish with green onions and serve hot with your favorite grilled cheese or some homemade garlic bread. Vegetable Broth - I always use Imagine Brand low-sodium. Depending on the actual size of your potatoes, you may need some addition vegetable broth if the soup is too thick after pureeing with hand blender. Leftovers heat well the following day. I love soups! and a chilled cheese sandwich is always a winner with them :) The combo of potato and leeks are always are a hit... 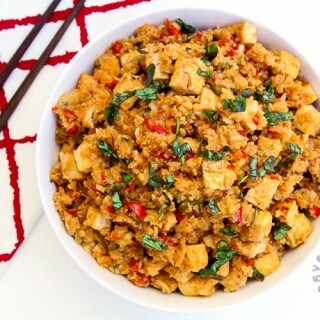 Thank you for sharing this lovely recipe, I need to try it next fall.. 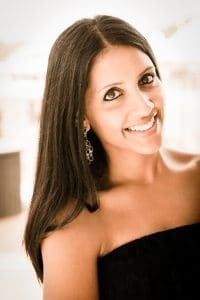 Thanks reshana!! Grilled cheese + soup = ultimate comfort food! 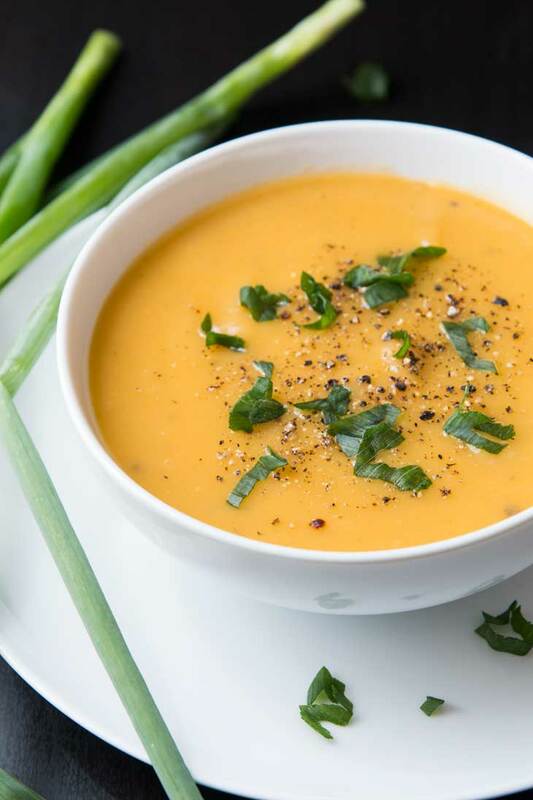 What a gorgeous soup recipe! I love the combo of leeks and potatoes and that it's pureed. Soup and sandwiches are probably my favorite quick fall meal! Adding this to my menu. Thanks! you'll love it! let me know if you try it sometieme. What a beautiful bowl of soup! I love the color, potato and leek sound great together. Yum. I always said leeks aren't used enough. I love them and they work beautifully in this recipe. That looks really tasty and the texture looks to be perfect, real silky. I haven't gotten into soups much yet, hopefully it will be cool longer than half a day so I can dive in head first! 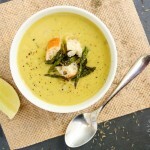 I love leek and potato soup and love that this one is so healthy and low fat! It's a beautiful colour too! Potato leek soup is one of my favorite winter soups. I love the beautiful color of your soup. I'm guessing it comes from the vegetable broth? Looks delicious. 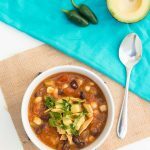 My family loves soups, and this one looks amazing! I'll be trying it as soon as the weather gets a little cooler. I know right??? 100 in October?? Crazy! I need it to get crisp and cool so I can get in the Fall/Winter/Holiday spirit!! That's what we gt for living in socal i guess ha! Hello,I haven't made the soup yet so I can't rate. I'm just curious about the colour. 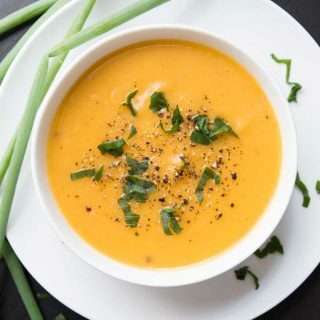 What makes this soup orange? Usually Leek & Potato soup is creamy white. It's more of a yellow-ish color mainly because of the combination of leeks/potatoes and vegetable broth. I take these pictures in natural sunlight and during the day. Don't do much color enhancement so it's probably the daytime color that came out.